We offer a wide selection of English language courses in Bournemouth which guarantee a steady yet fun progression. By choosing to study with us means you can expect great teaching, clear progress and an excellent service. Experience the UK like never before, learn in an authentic but modern environment and make friendships that last a lifetime. We aim to provide the kind of linguistic training and support that you need in order to make rapid progress. Attain a good degree of fluency and accuracy in English. Suitable for all English levels. Whatever your language needs we can provide an English course tailored to you. Our students include medical professionals, lawyers, pilots, hoteliers and many more. Prepare for an undergraduate or postgraduate course with our pre-sessional programmes. Gain expert advice from our University Counsellors and gain the UCAS points you require. Get ahead in your career, education or social life with the internationally recognised Cambridge exams. We will help you to prepare for these well-known exams and, as we are an approved test centre, you can take your exam with us too. Offer your group of students an experience to remember. We can provide tailored on your requirements. Contact us for your quote. We can offer packages to include activities, food, accommodation, tuition and more. Want to teach English as a foreign language? Athena Teacher Training delivers the CertTESOL Course, accredited by Trinity College London, which allows you to teach English in a British Council school in the UK or abroad. Get a quote for your course. Enter your specific course and services requirements and our calculator will give you a price estimate. Open your world to international students and offer them a taste of British culture. Being a host family is a rewarding experience and you will meet people from all over the world, while earning extra cash for your spare room. ETC offers junior programmes for children aged 12-17. Programmes include English tuition, accommodation, meals, transport and activities. Our Family programmes are for students aged 8-11 years old, with parents also studying at ETC. The ETC Family Programme is tuition-only and accommodation must be sourced privately. Students at ETC can benefit from staying in the ETC Residence, right next door to the school. Alternatively, experience British culture with one of our local homestays. 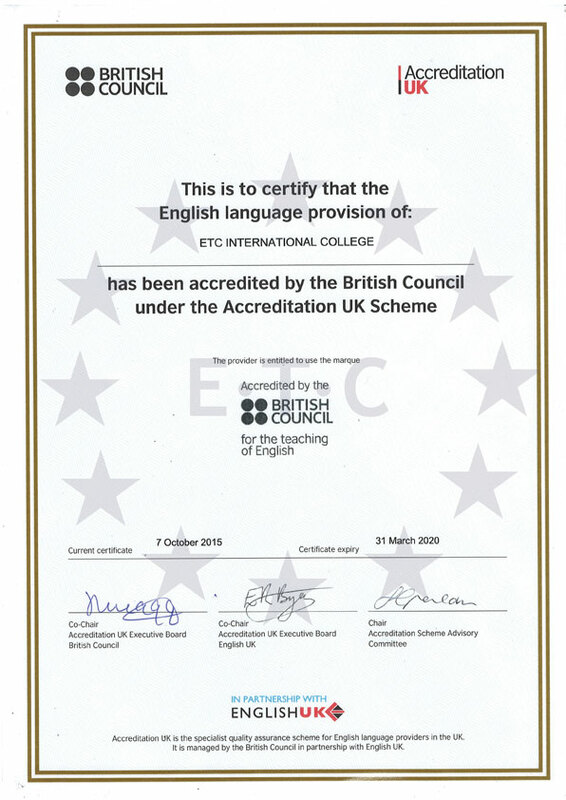 ETC has facilities to help you learn English and reach your full potential throughout your chosen English course. ETC offers a wide range of activities to suit all, including a free year-round adult activity programme. Discover Dorset and explore the UK. Let us know your flight details and we can pick you up from the airport and drop you at the door of your accommodation! Bournemouth offers a wealth of beautiful scenery, entertainment, culture and more. …And it’s clear to see why. Watch the videos below from Bournemouth Tourism and view our Bournemouth page to find out more about this brilliant town and it’s surroundings. Students’ welfare (including health and safety and the effectiveness of governance, leadership and management).